A Waterford-labeled goblet with a suspiciously low price and a feel and look that is different from other Waterford pieces might make you doubtful about its actual origin. But it's genuine -- Marquis Waterford is the manufacturer's mid-range brand, designed to appeal to younger, more moderate-income and contemporary buyers as they enter the crystal marketplace. Clean, simple lines dominate the pieces, which are crafted in Waterford's German, Portuguese and Eastern European factories. 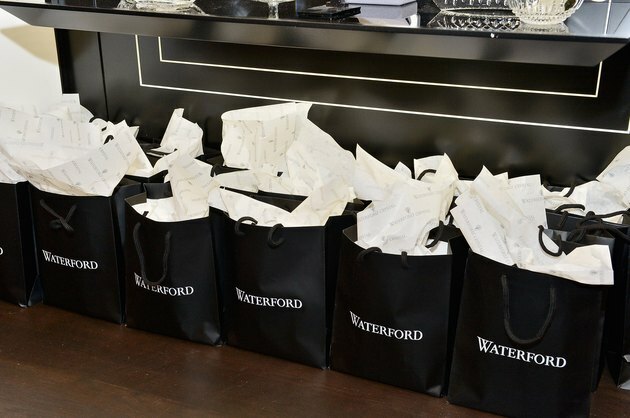 Waterford's Marquis line appeals to the contemporary, less well-heeled buyer. In 1991, looking to build its market reach and survive as a company, Waterford introduced the Marquis collection, its first new line in the company's 200-year history. Marquis looks like Waterford's fine crystal, but it differs in that it is not lead crystal -- it is crystalline, a quality, non-leaded glass. The Marquis line began with a few pieces, but the popularity of the collection grew quickly as demand increased. Today, the Marquis collection is front-and-center in most department stores, while traditional Waterford Crystal still remains a top seller, but displayed behind glass. Waterford crystal's history is based on its adherence to extremely high production standards. Crafted and cut by hand by master cutters, no piece of Waterford that isn't 100 percent perfect leaves the Irish factory. Less-expensive lines of Waterford, such as the Marquis Collection, while mouth-blown and hand-cut, reveal with a touch of the edges a less precise cut than on a traditional Waterford crystal piece. While the heft may be similar, the cuts are less intricate. When the Marquis line was introduced it was met with criticism by marketing consulting firms, reported The New York Times in June 1991, just before the line was brought to retail. Some felt Waterford was downgrading its flagship brand and diluting its market. Waterford proved them wrong when the large middle-market started buying the Marquis line, encouraging Waterford to expand its designs. Blue and white packaging denotes the Marquis line, while Waterford crystal remains in its traditional gray presentation boxes. While Waterford Crystal never discontinues a pattern, the Marquis line is marketed under a different directive. Extensive market research reveals which patterns are popular, and they remain in the portfolio. Lesser patterns, or lines that languish on the shelf, are discontinued. Once they've been discontinued, many Marquis patterns are found on the shelves of second-market retailers.